Saying goodbye to someone we care about is difficult, and it's never, ever perfect. As a culture (or maybe as a species,) we're just not that good at it because it doesn't feel great, and we're pleasure-seekers by nature. We all handle goodbyes differently, in ways that might have been modeled for us by early caregivers or ways relationships may have ended without our having a choice in the matter. Almost all of us have some degree of woundedness around goodbyes, whether they've left us with feelings of abandonment, anger, confusion, and/or grief. So when we say goodbye as adults, we might protect ourselves (often our younger child selves) in subtle ways that are not entirely conscious. We may belittle the meaningfulness of the relationship, skip over or avoid the goodbye by ghosting, say a breezy or empty goodbye because our true vulnerability is too difficult to show (or may be unsafe to show, in some cases.) We may be in denial of the goodbye, using a "see you later" mentality even when we won't actually see them later. We might linger, delay, or hold on in small ways so the goodbye isn't final. We might focus on unpleasant memories of the relationship, place blame, express anger, or unconsciously need to make the other person 'wrong' so we can emotionally withdraw so the ending doesn't hurt as much. We might drop a bomb (aka - big piece of news or big new emotion) at the end of a relationship on our way out the door so there isn't time to process it together. We might feel all of our real goodbye feels, but avoid eye contact or even the in-person parting. Some of us prefer to write a heartfelt letter to express our feelings about the ending. We may put the other person on a pedestal of admiration or shower them with compliments or gifts when parting. These are just a few examples of the limitless ways many of us defend against the pain of parting. Let me be clear: None of these behaviors are "bad" or "wrong" -- it's just how we human beings self-soothe around something really, really hard on our hearts. They are all brilliant adaptive strategies we've learned and practiced in order to cope with something difficult, unpleasant, raw, or sometimes threatening. Whichever strategy you've used in past relationship endings, it is okay because it has served and protected a vulnerable part of you -- likely a younger part. Honor your inner wisdom around it, while also examining it to see if you still want and need to do goodbyes in the way you have historically. As a therapist, goodbyes are something I think about a lot, because therapists tend to experience them a lot when it is time to end with a client. Our goodbyes ethically and legally need to be complete closure of the relationship. In the field of therapy, a goodbye between a client and a therapist is called "termination," though many shudder at that term, mostly due to the connotation around death. (Death is another type of goodbye our culture still has a hard time talking about, but that's another blog topic for another day.) Therapists aim say goodbye to our clients intentionally, and model what a healthy, conscious, authentic goodbye can look like. As therapists, we sign up to hold space for and honor whatever emotions, defenses, or projections (mostly unconscious) the goodbye brings up within each client - each scenario so unique and uncharted. Therapy is a microcosm for how a person does their life outside the therapy room, as well as a safe rehearsal-ground for what might be possible in future moments outside therapy. In the spirit of personal growth and rehearsing new ways of being, when a relationship between a therapist and client comes to an end, therapists can invite clients to engage in an ending experience that hopefully feels honoring and real - even if this way of being feels new, weird, and perhaps pushes against a growing edge. Sure, even the most intentional, conscious, healthy goodbye can still create a degree of longing, awkwardness, sadness, discomfort, or disappointment. That goes for both sides -- therapist and client -- because we're all human and sensitive and evolving. The difference is that therapy (and the ending of it) is in service of the client, and it is the therapist's job to process our own issues, in our own healing space and time, around endings and perhaps around the personal impact of what we're being asked hold in the service of each client. This is why self-care for healers is an ethical imperative. Even when co-creating a conscious goodbye experience in therapy, old habits may still play out, perhaps depending on a person's degree of readiness for change or the degree of woundedness around endings. In my therapist and human heart, I genuinely welcome and meet this with deep empathy, and I express it when given the opportunity. Growth can be so clunky and beautifully human for all of us, and we're all here to help each other grow. When closure is done with presence, authenticity, gratitude, vulnerability, intention, openness, and even ritual and celebration, goodbyes can be tremendously healing. The next time you are putting closure to a relationship of any kind, it's an opportunity to engage in a conscious goodbye, whether you have always done so, or whether you just wish to do it differently this time. At the very least, it's a chance to explore your relationship to "goodbye" and what your mode of operation has been around endings. To be authentic and frank in expressing your feelings when parting ways, and honoring the shared time and space of a relationship, is healing to the heart. This blog entry is a repost of an article I wrote, which was published in Grounded Magazine in their Autumn 2014 "Make" issue. I'm revisiting it on this Spring Sunday morning, as I listen to my now 3rd grade daughter in her singer-songwriter creative zone in the other room. Unfortunately Grounded Magazine is no longer being published, and I wanted this piece to live on, so I will share it here with you. Wishing a spacious and creative day to you and yours! My second grader and I linger at the table after breakfast on a brisk Autumn morning. I sip my light and sweet slow-drip and watch my mind fill with a Sunday to-do list: return emails, grocery shop, send birthday card. Out of the corner of my eye, I catch a twirl of our handmade driftwood mobile near the window. For the next few moments, my thoughts flip-flop between warm days along the coast and plans to pick up butter and stamps. Meanwhile, my daughter is grabbing a jar from a nearby shelf and is intensely engaged with acorn caps she collected on a walk yesterday. With profound focus, she is stacking them, lining them up, closely studying their shape and texture. She perches one between her thumb and pointer finger, declaring, “A perfect size for a fairy hat! Hey Mom, let’s make flower fairies!” Her proposal abruptly snaps me right back into the present moment, waking me from nostalgia for days passed and plans for the day ahead. One of the most profound gifts our children offer is reminding us to return to the present moment. As both a mother and a mindfulness-oriented art psychotherapist, I have learned the deep, lasting, and mutual benefits of making art alongside our children. I can say, from personal and professional experience, this practice is not easy in modern parenthood. When we sit down to draw with our children, it’s either the ding of our inbox or the relentless voice of the inner critic distracting us from true absorption in the activity. A creative home life requires making mental space and time much more than it demands an expertly appointed craft room. Cuddling on the couch with a bag of seashell souvenirs and a spool of yarn from the junk drawer to create a garland will be meaningful as long as we are able to be fully present in those moments. Our undivided attention is what fills children up most. The added benefit is that if we really show up, it can be deeply gratifying for parents, too. The best way I know how to enter into creative space with children is to slow everything down. Slowness is the antidote for the modern din, like an inverse yoga pose to balance all the rushing around. We can use the slow pace of the natural world as inspiration for the rhythm of our creative home lives. Step out for a family walk to absorb the colors, light, and offerings of each season, opening all senses to the experience. Dancing with the earth models deep, meaningful living for children, reaffirming that each beautiful detail is worth honoring. When we experience the world through a child’s perspective, we are able to tune into the hundreds of colors on the skin of an apple. We can recall the magic of watching yellow and blue paint mixed to a vibrant green for the very first time. Slowing down each step validates a child’s inborn need to investigate the process. In preserving this innate gift, we challenge our own glorification of efficiency and multitasking. Bringing mindfulness to our experiences heightens the ordinary into something extraordinary. It allows space for us to feel something and to respond to it. This is what art is meant to do. Making is our birthright as human beings. Children are aware of their inherent ability to create and are visibly enthusiastic about the life-affirming magic of putting something new into the world. Often adults have abandoned our inner makers for more socially sanctioned pursuits. The gabby inner art critic we carry can rest when we dive into a project with our children because they don’t expect us to be Martha Stewart or Wayne Thiebaud. Above all, they want to connect with our smiling eyes and benefit from seeing our committed engagement with the creative process. Art materials are food for the soul. When preparing a creative activity, whether for my art therapy adult clients or for my young daughter, I imagine I’m hosting a special dinner party with an intention of making my guests feel cherished. Much like a chef pairs specific flavors so as not to clutter the palette and overwhelm the senses, I edit the selection of materials. The menu varies, but the setting is always deliberate and the meal nourishing. I prepare the space with intentions of simplicity, beauty, and rhythm. I let in natural light and fresh air, assessing the space for distractions that could pull my family away from creative absorption. I turn off and cover electronic screens. I sweep away clutter that interrupts the eye. If I’m distracted by the worry that the “meal” will be messy, I simply cover the floor with an drop cloth, put butcher paper or oilcloth over the table, and we don smocks. If I still find mess to be an obstacle, I don’t cancel the party; we dine al fresco instead. Just as I would select food at the market for dinner, I incorporate natural materials that are local and in season into our buffet of creative offerings. This reinforces a child’s attunement with the rhythms of the earth and helps parents come back home to these inner movements of the soul. Natural objects account for half of the “art materials” in my home. We gather acorns, sticks, shells, stones, leaves, flowers, and pine cones and store them in large, clear jars on a dedicated shelf. Rather than a huge collection of art supplies, I invest in fewer, high-quality materials that promise a powerful sensory experience. Aside from basic paintbrushes, scissors, and glue, a few of my favorite art media are Stockmar beeswax crayons, liquid watercolors, Lyra Ferby colored pencils, wool roving, a variety of yarn and string, and white paper (140 lb. for painting and 80 lb. for drawing.) Knowing each type of art media holds an inherent metaphor, from the yielding way watercolors blend together to the resistance of a sharp pencil on paper, I purposefully select materials that will help balance the current mood. Children feel held when there is rhythm and appreciate a time each day or week devoted to making. Co-creating a ritual to mark creative time as sacred will bracket the experience as heightened and special, like lighting a candle or ringing a bell to begin and end art sessions. Embracing an experimental mindset when making with children helps us to honor the process. This doesn’t always mean letting go of the idea that we might create a product or a useful craft; rather, it allows for meandering, messes, and mistakes along the journey. I trust that the art materials will tell us which way to turn next, and I listen to them with focus and wonder so my daughter might do the same. Like all cycles, each creative process winds down to completion. Together, we clean our materials with respect and care. We set aside time to reflect upon what we have made, as this part of the creative process allows for integration and meaning-making. A child’s art holds his or her stories, emotions, worldview, and self-concept, so we treat the art with the same respect as the artist. I withhold my opinions and projections, being responsible to ask my daughter open-ended questions about her process and her creation. When the candle had been snuffed or the bell has been rung, my daughter is often recharged and seamlessly moves into solitary play. My to-do list is still waiting there for me, and I face it feeling more balanced, satisfied, and connected. In my maker-momma bones and my art therapist heart, I have intimately come to know the value of mindfully making creative space where flower fairies can fly. Today's blog is part of the mini-series on wellness rituals I love. In addition to drinking golden milk nightly and dry brushing before daily showers, this is another simple, sustainable way I enhance my physical well-being: Practicing yoga at home while watching my fav YouTube yogini, Adriene Mishler. Sure, I love going to live yoga classes at my local studio. There's something about the energy of the whole room practicing together that helps to hold the space. Realistically though, as a business owner and a mom to a young child, I can't always make it to my studio for regular classes. I've been practicing yoga (off and on) for nearly 2 decades, so while I know my way around a sun salutation, I have trouble motivating my way through a session without guidance. Enter: Yoga with Adriene. She's a lifesaver! Peruse her Youtube channel and find a video that speaks to you in this moment. I kicked off my relationship with Adriene via her 30-day yoga challenge, which was a perfect way to ease myself back into a regular practice and get into the ritual of doing it at home. The video below is her overview of the 30 Days of Yoga. See whatcha think. For my home practice, I just have some basics -- a mat, a block, and a bolster. That's all you need, and you can generally improvise on those last two items with stuff you already have at home. So, that's my third little tip for making wellness easy -- and in this case, actually fun! Namaste. Humans are tidal. We're made of mostly water and pulled by the moon in ways we may not even consciously realize. We undoubtedly feel its pull on our emotional and creative rhythms, so why not tune more into this natural cycle so it can empower and inform our lives? Reproduction is affected by the moon by way of menstruation, fertility, and birth rates. Lunar cycles have been proven to impact the hormones of animals (do your cats go bananas on full moon nights like mine do? ), along with influencing crime rates, traffic accidents, and hospital admittance. Acknowledging that this rhythm impresses upon our lives, bringing our awareness to it more fully, and using its power to guide our intentions can help us roll with the tide. A full lunar cycle, from new moon to new moon, lasts about 29.5 days. The new moon (or when the moon is in total darkness, resting in the shadow of the earth) is aligned with the idea of a fresh start and a new beginning. This is a time to start new projects and plant new seeds. It is a time to call forth energy to manifest something new over the following 14 days when the moon will be waxing, meaning the light part of the moon is growing. I enjoy setting intentions on a new moon for what I'd like to create for myself. I often smudge with the sacred wood, palo santo, to bring about fresh energy during this time. It is a wonderful time to create vision boards, soul collage cards, or to visualize what you would like to call into your life. The full moon (or when the moon is in total, circular brightness, with the sun shining upon its surface) is powerful when it comes to honoring manifestations, decision-making, and setting intentions for what to release as we move through the following 14 days when the moon will be waning. Waning means the light part will be decreasing in size, as we move toward the next new moon. This is a wonderful time for smudging with sage or cedar, herbs which assist us in cleansing ourselves or our space, as well as letting go of that which is no longer serving our greatest good. I also like to write on pieces of paper the things I hope to release, and to burn those pieces of paper during the time the moon is waning. On a practical note, the energy of the waning moon period supports cleaning out your home and space. The light of the full moon is also said to cleanse the energy held in crystals and stones, so you can set them outside or in a windowsill on the night of the full moon. 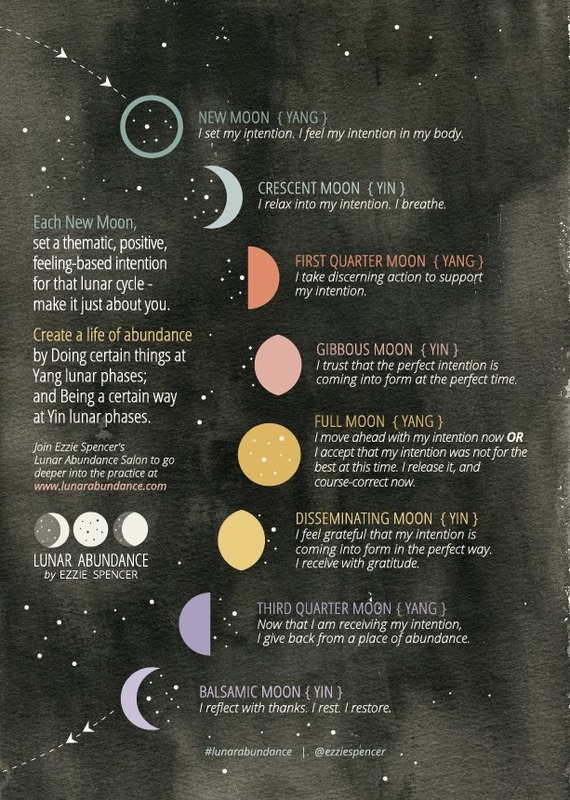 The graphic below, by Ezzie Spencer, gives guidance on the types of intentions we are invited to set during each specific phase of the moon, along its path of waxing and waning. So, look upward tonight. Remember that you are a part of nature -- connecting more deeply to your place in the universe -- and perhaps try a small ritual of your own, letting your awareness of the phase of the moon empower you more consciously. Graduation season is upon us, which always reminds me of the fact that the word "alma mater" translates as "nourishing mother." Doesn't graduating in some way feel like leaving a safe womb and going out into the world on one's own? When I graduated from Naropa University with my Masters degree in transpersonal psychotherapy and art therapy, I certainly felt like I was leaving a protective and nurturing space and bringing all I had gathered there to share with the greater community. It's fitting that this year's graduation ceremony at Naropa University takes place on Saturday, May 10, the day before mothers' day. The commencement address will be given by Pema Chödrön. Naropa will be live streaming the speech, so visit this link and sign up to watch. Naropa University is a unique and amazing place for contemplative education. If you're unfamiliar with the way education is offered at Naropa, watch the quick video below for a taste.